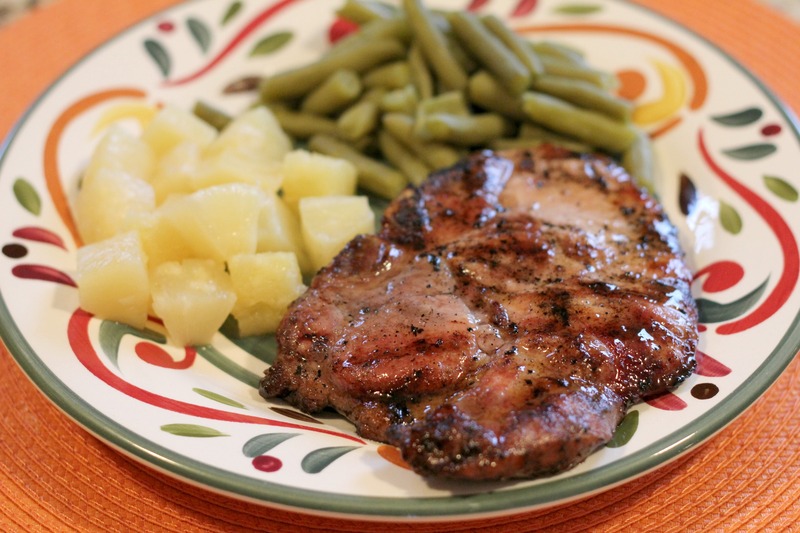 Mmm grilled pork chops…one of my all time favorite meals. Honestly, I think just a plain-jane hunk of pork on the grill is still delicious, even without marinades and glazes and what-not. However, those marinades and glazes can add LOTS of flavor and really seal in the juices to make the meat even more tantalizing. I think I have shared (many times) about my love for brown sugar. I gravitate towards recipes on pinterest with “brown sugar” in the title. When I was little and wanted a snack, I would go into the pantry and sneak spoonfuls of brown sugar. Mom, if you’re reading this, sorry I ate all your brown sugar…but it was worth it. The brown sugar glaze gives the perfect touch of sweetness to the savory grilled meat. This is a perfect weeknight meal because it only takes about 20 minutes to make. Plus, it’s a weight watchers recipe, which always makes me feel better about what I’m eating. 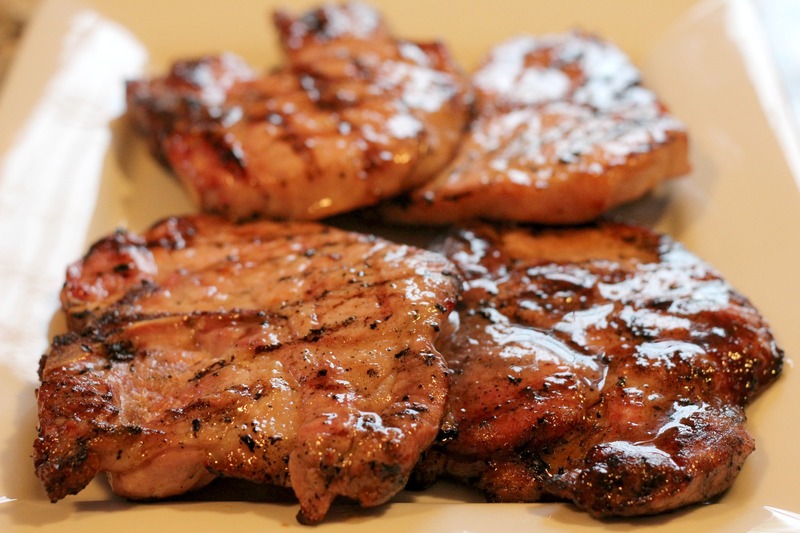 Hopefully wherever you live, you will have some beautiful weather soon where you can grill these amazing pork chops! Preheat grill to high heat. Cook pork over high heat for about 3 minutes on each side. Meanwhile heat 1 tablespoon butter in a large skillet over medium heat. Add garlic, brown sugar, and steak seasoning. Add wine and the remaining tablespoon of butter. Simmer 1 minute or until sauce thickens slightly. Turn grill down to medium heat. Brush glaze onto both sides of pork and continue grilling for another 5 minutes on each side, or until done. I’m grilling these chops tonight! Hope you like them as much as we did! What would be an equivalent to Montreal steak sauce? A-1 steak sauce? It’s actually a seasoning blend, not a sauce You could substitute it with any seasoning you like, really McCormick has a couple of steak or chicken seasonings, and they also have flavors like Garlic & Herb or Rosemary & Sundried Tomato I think the generic “steak seasoning” has a less potent flavor though, which is good for these pork chops because the glaze should be in the spotlight! Thanks for the clarification Now I know what to use!!! 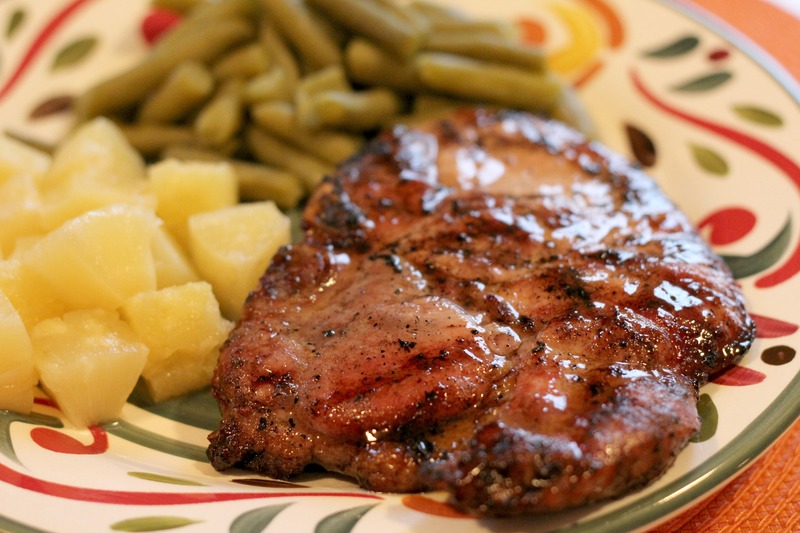 mmmm Cajun pork chops sounds good right now! You can bake them at 350 for about 20-30 minutes. Is there a substitution for the red wine if you don’t have any? You could try using grape juice or even chicken broth. It might change the flavor slightly, but it would still be good! What does the wine do to the pork? does it help keep moisture or is it a flavor thing? The wine creates the base for the sauce that you brush on the chops. It also adds flavor and richness. But don’t worry if you don’t like the wine because it doesn’t really taste the same once it’s cooked into the sauce. I hate the taste of wine but love this sauce!